The age-old road leading to Kiyomizu Temple had turned into a river of people. Accents and languages from across the world filled the shop-lined slope, as couples in rented kimono took photos with selfie sticks and amateur photographers tried to get a shot devoid of the crowds — a nearly impossible feat. 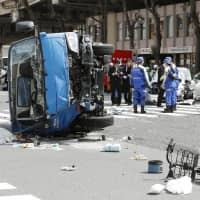 Tourists stood munching on yatsuhashi (traditional sweets made of rice flour and often filled with red bean paste) or holding cones of matcha (green tea) ice cream, and tour guides used megaphones and waved flags to ensure their groups stayed together. Others were just trying to make their way through the congestion to the iconic temple at the top. This is the reality of summer in Kyoto, a city crowded with an ever-increasing number of tourists. 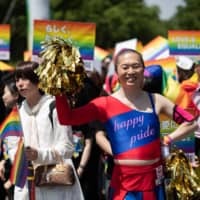 According to the Japanese National Tourism Organization, more than 20 million visitors entered the country in 2015 and the government has recently raised their target for 2020, the year of the Tokyo Olympics, to 40 million. 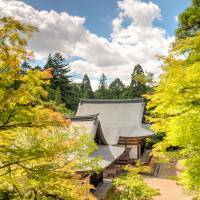 The ancient city of Kyoto — once the capital, and which many still consider to be the beating heart of Japanese civilization and culture — is a prime destination. In fact, recent survey rankings compiled by leading U.S. magazine Travel + Leisure bumped Kyoto from the top spot to sixth place on the magazine’s list of the world’s best tourist cities. Kyoto city officials suspect that the inundation of tourists may be one of the main causes for the drop. Expecting the horde, I arrive with an escape plan: I have my sights set on Takao, a mountainous area an hour northwest of downtown Kyoto where several peaks create an unspoiled wooded valley through which the Kiyotaki River flows. Unlike Tokyo’s Mount Takao, which is crowded with lines of hikers during the summer, Kyoto’s Takao offers a peaceful respite from the heat. It’s a place to escape the thronging city, visit historically significant temples and see verdant native forests. The bus bound for Takao is nearly full as it leaves central Kyoto, but only one other passenger is on board when I disembark an hour later. The air in the valley is pleasantly cool, and the Kiyotaki River flows lazily below. I cross an orange bridge marking the boundary between the mundane world and the sacred, wooded slopes beyond. On the other side, an elderly woman is sweeping a path, but she stops to greet me and suggests I climb the roughly 400 stone stairs to visit Jingoji Temple at Mount Takao’s peak. The walk gives me time to reflect on the temple’s history. 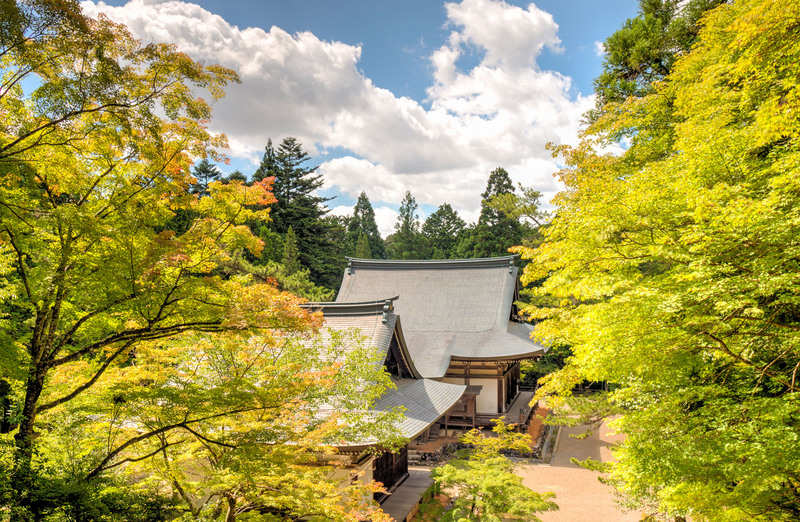 The temple’s first incarnation was known as Takaosanji, founded by Wake no Kiyomaro, the Nara Period (710-94) statesman who foiled the monk Dokyo’s designs on becoming Emperor. Kiyomaro was also responsible for recommending the site of present-day Kyoto for the new capital to Emperor Kammu. Before reaching the gate at the top of the stairs, I pass a large rock with a bowled depression on top, known as “Suzuri Ishi” (“inkwell rock”). According to legend, the Emperor asked a priest from Takao, famed for his calligraphy, to write the name plaque for a new temple. When the messenger arrived with the wooden plaque, the Kiyotaki River was so swollen and overflowing and he could not cross. The priest dipped his brush into some ink he had prepared on the stone and then flung the brush across the river. Rather than falling to the ground, it wrote the name of the temple on the plaque in beautiful characters, as if being held by an invisible hand. 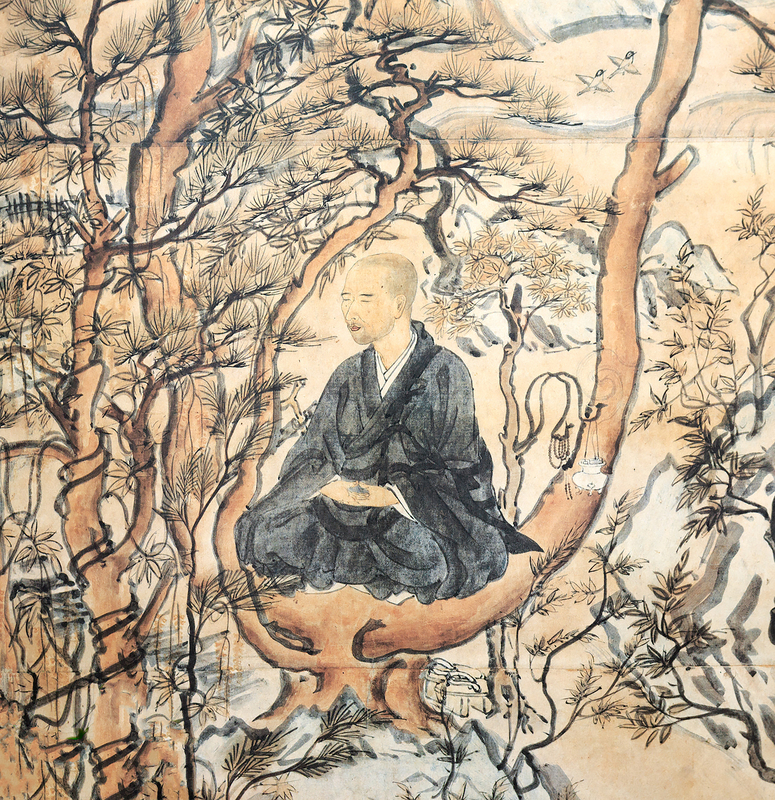 The monk was none other than Kukai (774-835), the father of Japanese esoteric Buddhism, who had made the arduous journey to China in 804 to study, and then returned to Japan to establish the Shingon school, which is today one of the major sects of Japanese Buddhism. 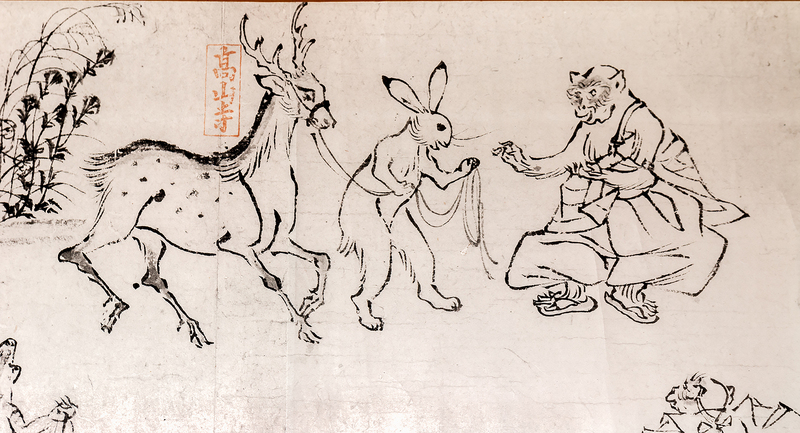 It was while staying at Takaosanji that he formulated and began propagating his faith. 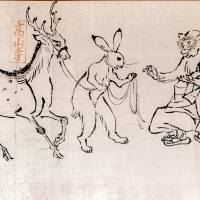 When the temple was amalgamated with Jinganji Temple in 824 and renamed Jingoji, Kukai was appointed head priest. In the autumn, crowds flock to the area to see the leaves turning brilliant shades of red, yellow and orange. However, in mid-summer all is quiet and the attendant at the small ticket booth by the weathered gate is glad to have someone to chat with. In addition to the ticket, I purchase two small clay saucers, which I will need later to partake in an old temple tradition. Beyond the gate, a large open area leads me toward a scattering of wooden halls that make up the temple complex. Due to fire, war and neglect, many of the current structures only date back to the 17th century. A majestic flight of stairs takes me up to a spacious hall topped with a broad roof that is even newer. This main hall was built in the early 20th century thanks to Yamaguchi Gendo, a wealthy businessman who donated the funds for it and the small pagoda on the hillside above. The dim interior of the hall contrasts sharply with the harsh summer sunlight outside. There is an array of Buddhist statues at the far end and a number of pictures on the walls. Hoping to learn more about them, I approach a temple attendant, who is delighted to act as my guide. The central statue, the attendant explains, is a standing Yakushi Nyorai, the Buddha of medicine and healing, which is the principal image of the temple and a national treasure said to date back to the early Heian Period (794-1185). I gaze into its narrow, kind eyes, and marvel at the idea that this figure has been witness to a countless number of people since it was carved around 1,200 years ago. Next, I walk beyond the temple buildings to a clearing high above the river from where I can see the green mountaintops stretch out before me. I take out the clay dishes I purchased earlier. I hold one in my hand and, with a snap of my wrist, send it flying. This popular tradition symbolizes the flinging away of evil and misfortune. I throw the second one and watch it sail out a short distance before dropping down and out of sight into the gorge below — hopefully taking bad luck with it. After leaving Jingoji, I walk along the river toward Kozanji Temple, passing a group of pilgrims in white and a few Japanese tourists. 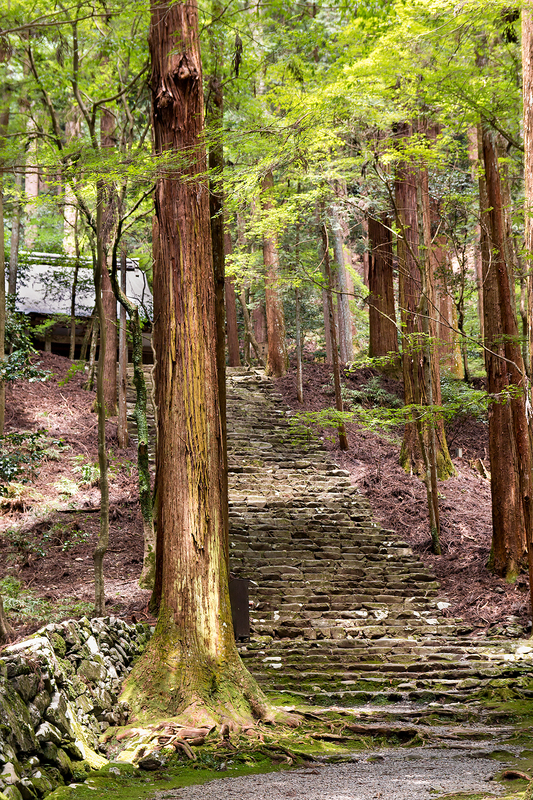 The temple is located on the slopes of Mount Toganoo, enveloped by numerous stately trees. Tradition holds that a temple was first established here in the eighth century, but its recorded history goes back to the priest Myoe (1173-1232), who founded the temple and is known for having kept a dream journal spanning several decades. The only structure remaining from the original temple is the Sekisuiin, a small thatched-roof hall. It is an outstanding example of Kamakura Period (1185-1333) architecture and has been designated a UNESCO World Heritage site. I walk along the veranda, looking out at a splendid view of the garden and surrounding mountain scenery before inspecting the items on display inside. 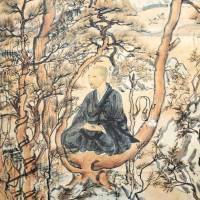 Among the temple’s treasures are a series of famous picture scrolls of frolicking animals, which some consider to be Japan’s earliest manga, and a wonderful painting of Myoe meditating in a tree. Retracing my steps, I find myself facing a narrow bridge with low-hanging branches leading to Saimyoji Temple, which was founded by Chisen, one of Kukai’s closest disciples. I don’t linger, but stop long enough to make a ¥100 offering and ring the temple bell. The reverberating sound fills the tranquil valley and gradually weakens until all is quiet and peaceful again. 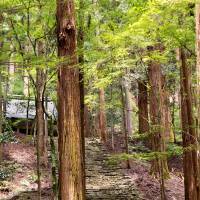 Mount Takao is a 50-minute bus ride from Kyoto Station via the JR Takao Keihoku Line bus. Disembark at the Yamashiro-Takao bus stop. Alternatively, take No. 8 Kyoto City Bus near Karasuma Station and Shijo Station and get off at the Takao bus stop. Momijiya (www.momijiya.jp/en; 075-871-1005) is a luxurious century-old inn with several open-air baths. It serves fine traditional Kyoto cuisine. Japanese- and Western-style rooms available. Takao Kanko Hotel (www.takaokanko-hotel.com; 075-871-2991) is an inn beside the Kiyotaki River. During the summer, you can watch traditional dancers while eating dinner. Japanese -style rooms only. Suzuri Ishi-tei (www.suzuriishitei.com; 075-872-3636) is an affordable restaurant near the gate to Jingoji Temple. It serves noodles and sweets, but is famous for its momiji mochi, sticky-rice cakes topped with red-bean paste. Kinsui-tei (www.kinsuitei.com; 075-861-0216) lets diners enjoy bento box lunches or full kaiseki ryōri (traditional multicourse cuisine) on platforms built on stilts over the Kiyotaki River, but only during the summer months.